I apologize about the delay in posts, I haven’t felt very inspired to write recently. Yesterday was Memorial Day, where we BBQ in honor of soldiers who have died defending our right to take a day off of work to BBQ. I don’t have many relatives who were soldiers, and I can’t think of any at all that died in a war. Both of my grandfathers had children when WWII happened and neither of them were drafted. My father and uncles were all slightly too young to serve in Vietnam, so I guess as far as wars go, we lucked out. Because of this, we don’t really “go all out” for Memorial Day like some people do. I understand what it means, I treat it the same as the other war holidays. 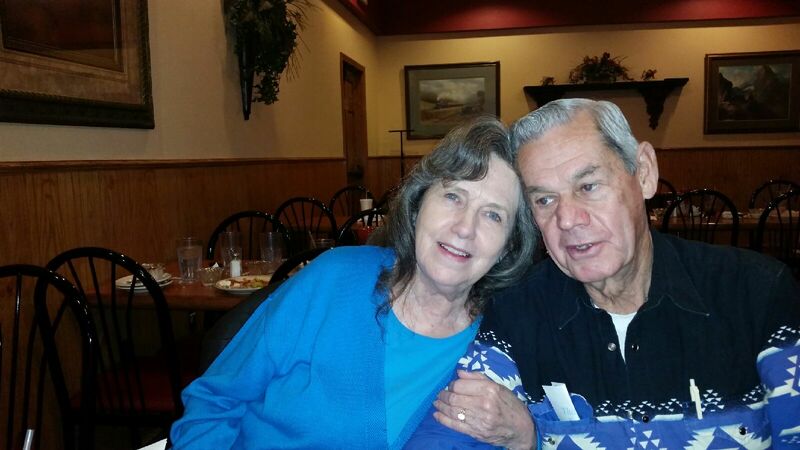 my beautiful grandma with my grandpa on her birthday. About two years ago, my grandmother started showing signs of Alzheimer’s. She had previously been incredibly intelligent, having worked as an insurance agent for over 30 years. She had clear blue eyes which were the windows to her soul. She grew up Baptist in the forties and fifties, her mother an art professor at the local University. Attention to detail has always been my grandmothers greatest attribute. Her handwriting is perfect. She remembers everyone’s birthdays and what year they graduated high school. She has every purchase the family has ever made written down and filed in a specific way that I can only dream of recreating. She was my original English teacher. She would correct me if I said “who” and I meant “whom” and taught me how to spell. She would tutor me in my subjects I wasn’t doing so well in, along with helping with my homework when I needed it. I don’t remember exactly when I knew something was off. Maybe it was when she called my boyfriend of three years by a name of one of my ex boyfriends from high school. That is a simple mistake though, anyone could make it. She would watch The Young and the Restless everyday, but she had to stop because she couldn’t remember who the characters were anymore. These are little things. Its not about the little things that she forgets, anyone can do that. When I visit her, I have to repeat myself constantly, even if she writes it down. “How is school/work” becomes a scripted conversation. Her eyes are becoming more and more vacant. The last time I went to her house, she was just blankly staring at the TV, which was off. She said she was waiting for her show to come on. I am afraid that the next time I see her, or the time after that, she isn’t even going to remember who I am. I have taken over the holiday cooking. Not that she really cooked much to begin with, but holidays really stress her out. She was beginning to forget when she put things in the oven, so she started buying all of the food premade. I decided that I wanted us to have good food instead of the instant, heartless food. Even when I do all of the cooking, she won’t even have a seat until everyone gets their plates. After dessert has been cleared, she will often go into her bedroom to lay down while the rest of us visit, as the day has overwhelmed her. I enjoy cooking for my family during these holidays, and I hope that I will be able to have Thanksgiving and Christmas at my own house this year. Everyone in the family knows whats going on. Some people are taking it differently than others. My father visits her weekly and always brings her a piece of cake or pie from wherever he eats on Sunday for lunch, just like he and I used to do for my great grandmother. This simple act of kindness shows that someone was thinking of her, and gives her someone to talk to for a few hours. My uncle who has an 11 year old daughter that our grandmother has been looking after has been taking it easy on grandma. He doesn’t leave Sky at her house for as long, and only when its necessary. He has also taken on the load of dealing with my other uncle who is about to go to prison. This is good because my grandparents don’t need that kind of stress on their lives at their age. My grandparents have since named him the person that executes their will. My aunt, on the other hand, really messed up. She tried to take advantage of my grandmother. She came all the way from St. Louis to ask my grandma for $30,000 that she said she let my grandma borrow. This is disgusting on so many levels. For one, as I said earlier, my grandma keeps records of literally everything. She immediately looked through her files for this alleged loan and found nothing. For two, she knew that my grandma was losing her memory and thought that she wouldn’t know what she was doing. Now we all know my aunts true personality. I can’t imagine what my grandfather is going through. He has worked all of his life to support his four children, while my grandma was the one actually present to take care of them. Often when he would get off of work and on his days off, he would go to the bars and ride his motorcycle with his friends, leaving grandma at home alone. This continued into retirement, which he did 15 years ago. He is rarely at home, he still spends most of his time at the bars and riding his motorcycle. He hasn’t aged a day since he turned 35, much like my father. Of course, this changed almost two months ago when my uncle (that I mentioned earlier) shot and killed his daughter. This has aged both of my grandparents at least 10 years. When I visited them yesterday, my grandma was at home alone like usual. Grandpa was riding his motorcycle in a Memorial Day parade, which wasn’t surprising because he rides with his friends at soldiers funerals and other parade events. Grandmas once luminescent skin is now blotchy and wrinkled. Her laugh lines are now crows feet and the bags under her eyes have grown considerably, as if she hasn’t slept in a month. She seemed happy to see me. I wished that I would have gotten to her house earlier to take her out to lunch. I am going to have to do this soon. She said that her favorite place to eat is Olive Garden because she likes endless salads. She asked the same questions over and over again, but I have learned to be patient. That is the key to living with someone with Alzheimer’s. Patience. I’m not sure how things are going to be in the future, but I will try to be there for her even when its hard. I have a good amount of guilt because I don’t have that much time on my hands to visit her as much as I want. I wish that she lived closer to me, as this would make it easier to visit whenever I want. I currently have to drive 20 minutes into the country outside of the town I live, and 20 minutes back. I also have to visit before 5pm because after this she is too tired to have a real conversation with. My grandma is my inspiration. She is the strongest woman in my life, even when she is frail. I hope that I am just as good of a person as she, and that I will have so many people that love me when I’m her age. She has always been supportive of me and all of my life choices.She is humble, kind, and open-minded. I love my grandma more than anyone else in my life and I hope she knows how much she means to me. Next postMy local police department put this cringe-worthy video on their Facebook page and I thought I’d share.